1 Who is Charles Barkley? 6 What is Charles Barkley’s Net Worth? Born Charles Wade Barkley under the sign of Pisces on the 20th of February 1963 in Leeds, Alabama USA, Charles is a 55-year-old African-American retired professional basketball player (power forward) and a sports analyst. Also nicknamed ‘Chuck’, ‘Sir Charles’ and ‘The Round Mound of Rebound’, he is perhaps best known to the world for his highly significant presence in the NBA over the course of 16 years, during which time he established himself as one of the most dominant power forwards in American basketball history. He has had a number of successes as both a player and an analyst in his often lucrative NBA career since 1984. Charles was raised apparently an only child in his birthplace by his parents of unknown names and professions. His interest in basketball developed at a very early age, and he was already intent on becoming a great player upon starting at Leeds High School in his hometown, where he was at the time denied a place on the varsity team and was instead listed as a reserve, due to the fact that he was 5ft 10ins (1.78m) tall and weighed 220lbs (100kg). Later on, Barkley experienced quick development during the summer, and returned to school at 6ft 4ins (1.93m), thus earning a starting position on the varsity team as a senior. His average points per game were 19.1 and his rebounds 17.9, while he also helped his team establish a 26-3 record that took them to the semifinals, at which point he scored 26 points versus Alabama’s most highly recruited player named Bobby Lee Hurt. 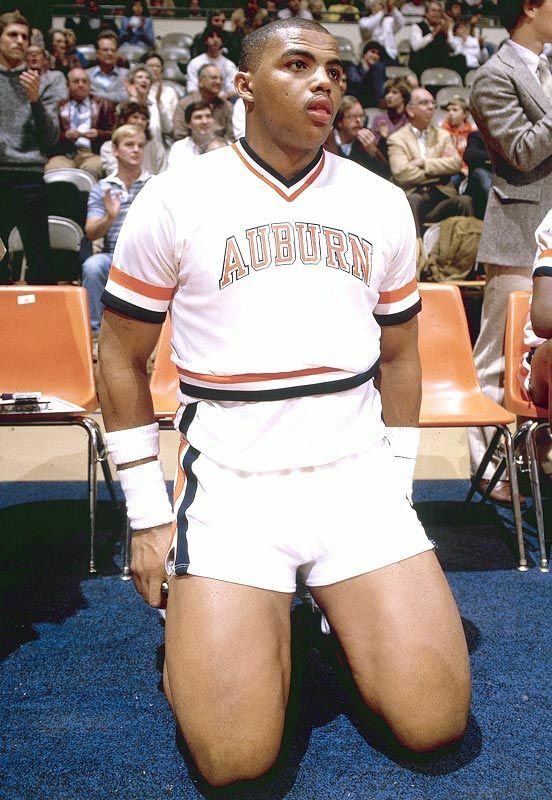 Having witnessed his performance, Auburn University’s head coach Sonny Smith decided to recruit Charles, and he thus enrolled there following his matriculation in 1981. Barkley spent three seasons playing collegiate basketball at Auburn University. He had issues with maintaining proper weight, but that didn’t stop him from excelling as a sportsman, and he thus led the Southeastern Conference (SEC) in rebounding all three years. He made up for his lack of height and excess body weight with various crowd pleasing moves on the court, which helped him become seen as any other great player with proper body measurements. Eventually, thanks to his habit to not pass the ball after rebounding and instead dribble over to the opposite end of the court and finish with a slam dunk, he earned the aforementioned nickname ‘The Round Mound of Rebound’. He played in the center position during his college years, even though he was shorter than the average center. He eventually became a member of Auburn University’s All-Century team, and still holds its record for career field goal percentage at 62.6%. Over the three years, he averaged 14.8 points per game, 9.6 rebounds, 1.6 assists and 1.7 blocks. While still in college in 1984, he participated in the NCAA Tournament, after which he finished with 23 points per game on 80% field goal shooting, as well as 17 rebounds, 14 assists, 2 steals and 2 blocks. (Re) Living the DreamNBA TV will celebrate the 20th anniversary of the Dream Team with an exclusive documentary. As for Barkley’s romantic involvements, he has been married to Maureen Blumhardt since the 9th of February 1989. Though Charles is yet to get a son, he and his wife have a daughter named Christiana Barkley, who was born in the same year as their wedding. The family lives together in in Scottsdale, Arizona – there hasn’t been any controversy surrounding his marriage. What is Charles Barkley’s Net Worth? Have you ever wondered how rich Charles Barkley is, as of mid-2018? According to various authoritative sources, it has been estimated that the current total of Charles’ accumulated net worth is close to $40 million, made largely as a basketball player and then an analyst, mostly as one of the most accomplished power forwards in NBA history. Though retired from playing, he still works as an analyst today, and endorses various brands, so the said amount can be expected to increase. Concerning the physical attributes of the retired power forward, his height is 6ft 6ins (1.98m) and his current weight is 251lbs (114kg). His hair is pitch dark (although he is now generally bald) and his eyes are dark brown, while his body shape is generally described as curvy. Due to the major influence of social networks, it is nowadays a regular thing for active celebrities to nourish a close and active relationship with their fans, for the sake of increasing the popularity of the projects they’re working on, and thus their own net worth. Charles seems to be a regular subscriber of this celebrity trend, as his presence is quite ubiquitous on most of the popular social media networks. His Facebook page has over 10,000 followers, his Twitter account almost 70,000 – he doesn’t have an Instagram account.